The party organized to celebrate the arrival of Italy’s populist Five Star Movement party leader Luigi Di Maio in his home town of Pomigliano, in Italy on March 6, 2018 after Italy’s general elections. Supporters of Italy’s populist Five Star Movement party wait for their leader Luigi Di Maio to arrive at a meeting after Italy’s general elections in Acerra, Italy on March 6, 2018. A supporter of Italy’s populist Five Star Movement party waits for his leader Luigi Di Maio to arrive at a meeting after Italy’s general elections in Acerra, Italy on March 6, 2018. Microphones are set on a table before a press conference of former Prime Minister and leader of the Democratic Party (PD), Matteo Renzi, a day after Italy’s general elections on March 5, 2018 at the PD headquarters in Rome. The centre-left coalition led by Renzi’s Democratic Party (PD), in power going into the elections, is set to pick up just 23.6 percent of the vote in Sunday’s election, down on the last polling figures allowed before the election and a huge blow to the PD’s chances of being part of the next government. Five Stars Movement candidate premier Luigi Di Maio attends a press conference at the Five Stars electoral headquarter in Rome, Italy on March 5, 2018. A journalist waits the first exit polls after the Italian general election in Rome, Italy on March 4, 2018. The economy and immigration are key factors in the 2018 Italian General Election after parliament was dissolved in December 2017. A woman casts her vote at a polling station in Fiuggi, Italy on March 4, 2018. Italians vote today in one of the most uncertain elections of the country, with populist and far-right parties expected to make major gains and Silvio Berlusconi that try to have a leading role. Nuns queue to vote at a polling station in Fiuggi, Italy on March 4, 2018. Italians vote today in one of the most uncertain elections of the country, with populist and far-right parties expected to make major gains and Silvio Berlusconi that try to have a leading role. 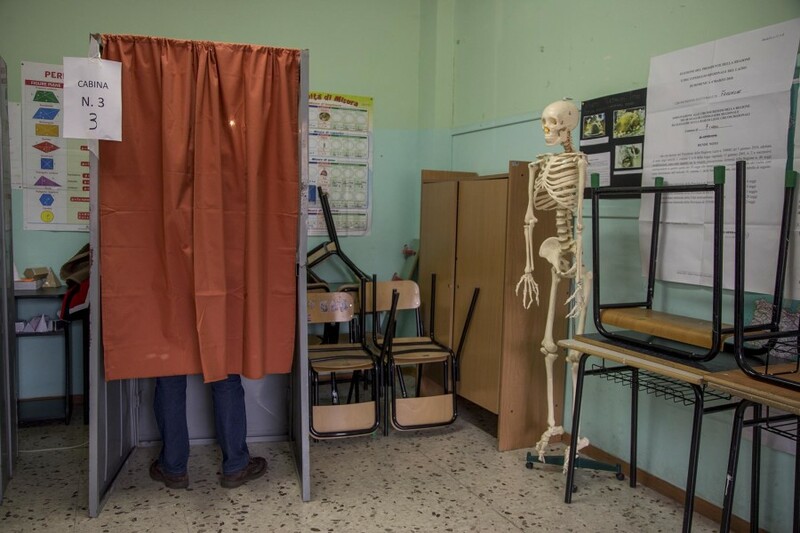 A man casts his vote at a polling station in Fiuggi, Italy on March 4, 2018. Italians vote today in one of the most uncertain elections of the country, with populist and far-right parties expected to make major gains and Silvio Berlusconi that try to have a leading role. “Five star movement” leader and candidate Prime Minister Luigi Di Maio speaks during the finally rally ahead of the March 4 elections in downtown Rome, Italy on March 2, 2018. A “Five star movement” supporter during the finally rally of candidate Prime Minister and “Five star movement” leader Luigi Di Maio in downtown Rome, Italy on March 2, 2018. A “Lega” party flag is seen before the political rally led by “Lega” party leader and candidate Prime Minister Matteo Salvini outside “Atlantico live”, in Rome, Italy on March 1, 2018. Italian “Lega” party leader and candidate Prime Minister Matteo Salvini speaks during a political rally inside “Atlantico live”, in Rome, Italy on March 1, 2018. A “Lega” party supporter gets an interview before the political rally led by “Lega” party leader and candidate Prime Minister Matteo Salvini inside “Atlantico live”, in Rome, Italy on March 1, 2018. Italian “Lega” party supporters attend a political rally led by “Lega” party leader and candidate Prime Minister Matteo Salvini inside “Atlantico live”, in Rome, Italy on March 1, 2018. Leader of the Italian right-wing “Forza Italia” party Silvio Berlusconi gestures as he delivers a speech on stage during a campaign rally in Manzoni theater in Milan, Italy on February 25, 2018. Supporters of the Italian right-wing “Forza Italia” party during a conference of Silvio Berlusconi inside Manzoni theater in Milan, Italy on February 25, 2018. Leader of the Italian right-wing “Forza Italia” party Silvio Berlusconi gestures as he delivers a speech on stage during a campaign rally inside Manzoni theater in Milan, Italy on February 25, 2018. A supporter of the Italian right-wing “Forza Italia” party during a conference of Silvio Berlusconi inside Manzoni theater in Milan, Italy on February 25, 2018. A man sells gadgets of right-wing “Forza Italia” party before a conference of Silvio Berlusconi inside Manzoni theater in Milan, Italy on February 25, 2018. Italian “Lega” party supporters attend a political rally led by candiate Prime Minister Matteo Salvini in Duomo square in Milan, Italy on February 24, 2018. Italian “Lega” party leader and candidate Prime Minister Matteo Salvini speaks during a political rally in Duomo square, in Milan, Italy on February 24, 2018. Italy’s far-right CasaPound movement Vice-President and candidate Prime Minister Simone Di Stefano speaks during a public conference in Milan, Italy on February 24, 2018. People take a picture with Italy’s far-right CasaPound movement Vice-President and candidate Prime Minister Simone Di Stefano after a public conference in Milan, Italy on February 24, 2018. “Five star movement” leader and candidate Prime Minister Luigi Di Maio speaks during a conference at Comunale theatre in Caserta, Southern Italy on February 23, 2018. People at work before the conference of Lega party leader and candidate Prime Minister Matteo Salvini inside San Marco cinema in Caserta, Southern Italy on February 21, 2018. Electoral campaign signs are seen inside San Marco cinema before a conference of Lega party leader and candidate Prime Minister Matteo Salvini in Caserta, Southern Italy on February 21, 2018. A Lega party supporter is seen before the conference of the candidate Prime Minister and Lega party leader Matteo Salvini inside San Marco cinema in Caserta, Southern Italy on February 21, 2018. Lega party leader and candidate Prime Minister Matteo Salvini speaks during a conference inside San Marco cinema in Caserta, Southern Italy on February 21, 2018. A man takes a selfie with Lega party leader and candidate Prime Minister Matteo Salvini after a conference inside San Marco cinema in Caserta, Southern Italy on February 21, 2018. A man takes a picture with Lega party leader and candidate Prime Minister Matteo Salvini after a conference inside San Marco cinema in Caserta, Southern Italy on February 21, 2018. People take a picture with Lega party leader and candidate Prime Minister Matteo Salvini after a conference inside San Marco cinema in Caserta, Southern Italy on February 21, 2018. A big screen shows how to vote for “Forza Italia” party before the conference of the leader of “Forza Italia” Campania section Mara Carfagna inside Supercinema theatre in Castellammare di Stabia, Southern Italy on February 20, 2018. “Forza Italia” supporters are seen before a conference of the leader of “Forza Italia” Campania section Mara Carfagna inside Supercinema theatre in Castellammare di Stabia, Southern Italy on February 20, 2018. Leader of “Forza Italia” Campania section Mara Carfagna sis seen before a conference inside Supercinema theatre in Castellammare di Stabia, Southern Italy on February 20, 2018. Election flyers of Lega party leader and candidate Prime Minister Matteo Salvini are seen on a table before the conference of “Forza Italia” Campania section leader Mara Carfagna inside Supercinema theatre in Castellammare di Stabia, Southern Italy on February 20, 2018. “Forza Italia” supporters are seen during a conference of the leader of “Forza Italia” Campania section Mara Carfagna inside Supercinema theatre in Castellammare di Stabia, Southern Italy on February 20, 2018. Leader of “Forza Italia” Campania section Mara Carfagna speaks during a conference inside Supercinema theatre in Castellammare di Stabia, Southern Italy on February 20, 2018. A flag of “Forza Italia” party is seen during the conference of the leader of “Forza Italia” Campania section Mara Carfagna inside Supercinema theatre in Castellammare di Stabia, Southern Italy on February 20, 2018. Leader of “Democratic party” and candidate Prime Minister Matteo Renzi attends a conference at Franco Parenti theatre in Milan, Italy on February 25, 2018. Supporters of “Democratic party” before a conference of candidate Prime Minister Matteo Renzi inside Franco Parenti theatre in Milan, Italy on February 25, 2018. Leader of “Democratic party” and candidate Prime Minister Matteo Renzi attends a conference at Sannazaro theatre in Naples, Italy on February 17, 2018. A supporter of “Democratic party” is seen before the conference of the “Democratic party” leader and candidate Prime Minister Matteo Renzi at Sannazaro theatre in Naples, Italy on February 17, 2018. A supporter of “Democratic party” prepares flags before the conference of the “Democratic party” leader and candidate Prime Minister Matteo Renzi at Sannazaro theatre in Naples, Italy on February 17, 2018. Police officers take security measures as they clash with anti-fascist protesters during a rally against the far-right wing party CasaPound in visit at Ramada hotel in Naples, Italy on February 18, 2018. Police officers clash with anti-fascist protesters during a rally against the far-right wing party CasaPound in visit at Ramada hotel in Naples, Italy on February 18, 2018. Electors put up campaign posters before the beginning of the conference of “Più Europa” party leader and Premier candidate Emma Bonino inside Basilica of Incoronata Madre del Buon Consiglio of Capodimonte in Naples, Italy on February 17, 2018. Leader of “Più Europa” party and Premier candidate Emma Bonino interviewed by journalists before a conference inside Basilica of Incoronata Madre del Buon Consiglio of Capodimonte in Naples, Italy on February 17, 2018. Leader of “Più Europa” party and Premier candidate Emma Bonino attends a conference inside Basilica of Incoronata Madre del Buon Consiglio of Capodimonte in Naples, Italy on February 17, 2018. Spokesperson of left-wing movement “Potere al Popolo” Viola Carofalo and leader of French political movement “La France insoumise” Jean-Luc Mélenchon attend a conference inside the social center “Ex Opg Je sò pazzo” in Naples, Italy on February 15, 2018. Leader of French political movement “La France insoumise” Jean-Luc Mélenchon supports the left-wing movement “Potere al Popolo” during a conference inside the social center “Ex Opg Je sò pazzo” in Naples, Italy on February 15, 2018. Spokesperson of left-wing movement “Potere al Popolo” Viola Carofalo attends a conference inside the social center “Ex Opg Je sò pazzo” in Naples, Italy on February 15, 2018. Leader of French political movement “La France insoumise” Jean-Luc Mélenchon and spokesperson of left-wing movement “Potere al Popolo” Viola Carofalo during a conference inside the social center “Ex Opg Je sò pazzo” in Naples, Italy on February 15, 2018. Spokesperson of left-wing movement “Potere al Popolo” Viola Carofalo is portrayed inside the social center “Ex Opg Je sò pazzo” in Naples, Italy on February 15, 2018. A general view of the social center “Ex Opg Je sò pazzo” of in Naples, Italy on February 15, 2018. Leader of “Fratelli d’Italia” party and candidate Prime Minister Giorgia Meloni visits NauticSud fair during her electoral campaign in Naples, Italy on February 14, 2018. Leader of “Fratelli d’Italia” party and candidate Prime Minister Giorgia Meloni speaks with journalist in Salerno, Italy on February 14, 2018. A camper with a poster of “Fratelli d’Italia” party leader and candidate Prime Minister Giorgia Meloni is seen in Salerno, Italy on February 14, 2018. Leader of “Fratelli d’Italia” party and candidate Prime Minister Giorgia Meloni during her electoral campaign in Salerno, Italy on February 14, 2018. A poster representing “Five star movement” leader and candidate Prime Minister Luigi Di Maio outside Sports Hall in Pomigliano d’ Arco, Italy on February 12, 2018. “Five star movement” leader and candidate Prime Minister Luigi Di Maio speaks during a conference at Sports Hall in Pomigliano d’ Arco, Southern Italy on February 12, 2018. “Five star movement” supporters listen the speech of “Five star movement” leader and candidate Prime Minister Luigi Di Maio during a conference at Sports Hall in Pomigliano d’ Arco, Italy on February 12, 2018. “Five star movement” founder Beppe Grillo speaks during a conference at Santa Croce square in Torre del Greco, Southern Italy on February 12, 2018. “Five star movement” leader and candidate Prime Minister Luigi Di Maio speaks during a conference at Santa Croce square in Torre del Greco, Southern Italy on February 12, 2018. “Five star movement” supporters listen the speech of candidate Prime Minister Luigi Di Maio during a conference in Torre del Greco, Southern Italy on February 12, 2018. People take a picture with “Five star movement” leader and candidate Prime Minister Luigi Di Maio after a conference inside Maddaloni gym in Scampia, near Naples, Italy on February 12, 2018. “Five star movement” leader and candidate Prime Minister Luigi Di Maio speaks during a conference at Sannazaro theatre in Naples, Italy on February 12, 2018. “Five star movement” leader and candidate Prime Minister Luigi Di Maio speaks during a conference at Hotel de la Ville in Avellino, Italy on February 11, 2018. “Five star movement” supporters listen the speech of candidate Prime Minister Luigi Di Maio during a conference at Hotel de la Ville in Avellino, Italy on February 11, 2018. The opening of “Forza Italia” electoral campaign at Hotel Royal Continental in Naples, Italy on February 3, 2018. “Forza Italia” supporters participate at the opening of the party’s electoral campaign at Hotel Royal Continental in Naples, Italy on February 3, 2018. Leader of “Forza Italia” Campania section Mara Carfagna speaks during the opening of the party’s electoral campaign at Hotel Royal Continental in Naples, Italy on February 3, 2018. President of Italian Senate, leader of “Liberi e Uguali” party and candidate Prime Minister Pietro Grasso speaks during a conference at Sannazzaro theatre in Naples, Italy on February 2, 2018. “Liberi e Uguali” party supporters listen the speech of President of Italian Senate and candidate Prime Minister Pietro Grasso during a conference at Sannazzaro theatre in Naples, Italy on February 2, 2018. “Liberi e Uguali” party supporters before the speech of President of Italian Senate and candidate Prime Minister Pietro Grasso at Sannazzaro theatre in Naples, Italy on February 2, 2018. Italy’s far-right CasaPound movement flags are seen before the arrival of Italy’s far-right CasaPound movement Vice-President and candidate Prime Minister Simone Di Stefano at Villa Cortigiana del Re in Somma Vesuviana, Italy on January 13, 2018. Italy’s far-right CasaPound movement Vice-President and candidate Prime Minister Simone Di Stefano (right) during the tour “Direzione Parlamento” at Villa Cortigiana del Re in Somma Vesuviana, Italy on January 13, 2018. Italy’s far-right CasaPound movement Vice-President and candidate Prime Minister Simone Di Stefano (left) and citizen spokesman for CasaPound in Naples Emmanuela Florino (right) during the tour “Direzione Parlamento” at Villa Cortigiana del Re in Somma Vesuviana, Italy on January 13, 2018. Italy’s far-right CasaPound movement Vice-President and candidate Prime Minister Simone Di Stefano during the tour “Direzione Parlamento” at Villa Cortigiana del Re in Somma Vesuviana, Italy on January 13, 2018. Italy’s far-right CasaPound movement Vice-President and candidate Prime Minister Simone Di Stefano releases an interview during the tour “Direzione Parlamento” at Villa Cortigiana del Re in Somma Vesuviana, Italy on January 13, 2018. Italy’s far-right CasaPound movement Vice-President and candidate Prime Minister Simone Di Stefano speaks with journalists during the tour “Direzione Parlamento” outside CasaPound’s home in Avellino, Italy on January 13, 2018. Italy’s far-right CasaPound movement supporters listen the speech of CasaPound Vice-President and candidate Prime Minister Simone Di Stefano during the tour “Direzione Parlamento” at CasaPound’s home in Avellino, Italy on January 13, 2018. Italy’s far-right CasaPound movement Vice-President and candidate Prime Minister Simone Di Stefano speaks during the tour “Direzione Parlamento” at CasaPound’s home in Avellino, Italy on January 13, 2018. People support with their signature the presentation of the Italy’s far-right CasaPound movement list in the 2018 Italian election at CasaPound’s home in Avellino, Italy on January 13, 2018. Italy’s far-right CasaPound movement Vice-President and candidate Prime Minister Simone Di Stefano drinks a glass of beer after his speech at CasaPound’s home in Avellino, Italy on January 13, 2018. A man holds a flag of PCI (Italian Communist Party) during the presentation event of the left-wing movement “Potere al Popolo” inside Modernissimo cinema in Naples, Italy on January 21, 2018. Journalist and activist Francesca Fornario (left) and spokesperson of left-wing movement “Potere al Popolo” Viola Garofalo (right) attend a conference to present the party candidates list inside Modernissimo cinema in Naples, Italy on January 21, 2018. Spokesperson of left-wing movement “Potere al Popolo” Viola Garofalo attends a conference to present the party candidates list inside Modernissimo cinema in Naples, Italy on January 21, 2018. People attend the presentation event of the left-wing movement “Potere al Popolo” inside Modernissimo cinema in Naples, Italy on January 21, 2018. Candidate for the Chamber of Deputies Chiara Capretti attends a conference to present the candidates list of left-wing movement “Potere al Popolo” inside Modernissimo cinema in Naples, Italy on January 21, 2018. President of Italian Senate and leader of “Liberi e uguali” party Pietro Grasso is portrayed before a conference in “Casa Don Diana” in Casal di Principe, Italy on January 21, 2018. President of Italian Senate and leader of “Liberi e uguali” party Pietro Grasso is portrayed during a conference in “Casa Don Diana” in Casal di Principe, Italy on January 21, 2018. President of Italian Senate and leader of “Liberi e uguali” party Pietro Grasso speaks during a conference in “Casa Don Diana” in Casal di Principe, Italy on January 21, 2018.